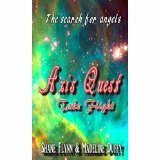 Axis Quest, Take Flight is the second book in the Axis Quest series. It resumes where the first book, Axis Quest, The Beginning left off. Lily is still facing the reality of the biggest betrayal she’s ever known. As Lily and her Granny continue to spend valuable time together, Granny is ever teaching Lily about God and the spiritual realm where so much more is happening than she ever considered. Lily and Granny help a stranger who is attacked by a snake. They find he has been closer to them than they thought and in learning more about him, they discover that loving a brother in Christ means taking action whenever possible. As Lily has been growing stronger in her faith, she returns to her home only to find it’s in complete disarray. Heartbroken by her family’s lack of concern for her, she returns to Granny for counsel. While there, Mr. Blue Eyes returns and requests help for his farm. In wisdom, Lily and Granny discuss the options of helping him. Overall, the second book in the Axis Quest series is a good read. It leaves the reader hanging and ready for the next book in the series. I give it four out of five stars. I received this book from the authors in exchange for my review which I’ve provided here.